Post-Graduation Plans:Though the specifics of my post-graduation life are uncertain, I hope to work for a nonprofit organization, using the skills I have gained through Dance Marathon and Children’s Miracle Network Hospitals. One of the key issues that I have seen with Dance Marathon is a limited scope in regards to fundraising. Especially within Ole Miss, Greek organizations have been the primary source of fundraising and recruitment successes, yet these resources will eventually plateau. There is only so much that can be acquired from these groups through their fundraising, however, an effort should be made to reach more students than just those in Greek organizations. The need for diversified recruitment, especially as it relates to different racial and socioeconomic groups of students on campus, has been one of my main goals in my Dance Marathon experience. I have worked to ensure that RebelTHON understands the idea that our previous recruitment motto of, “if we can get them to the event, they’ll fall in love For The Kids” is not necessarily true. 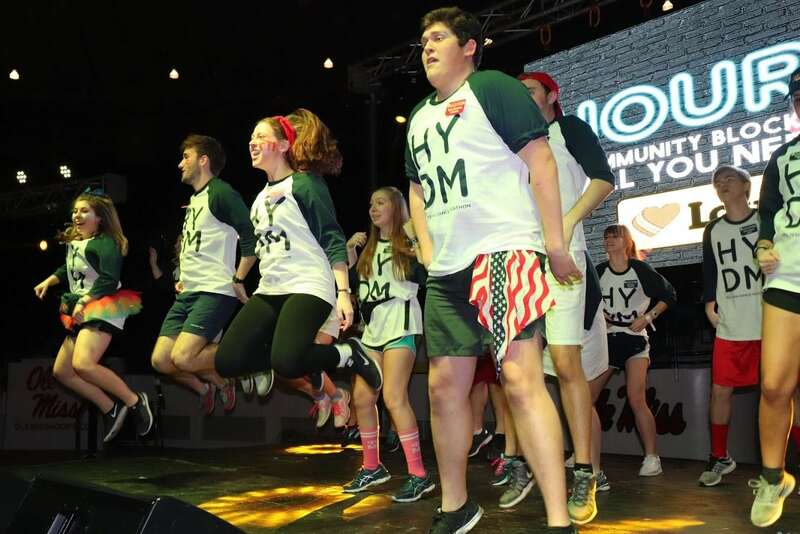 There will be members of the Ole Miss family who will never feel comfortable or be interested in participating in a large-scale dance marathon, but that does not mean that they do not have a place in our movement. In working to make sure that our organization is widening its scope of influence to spread awareness and raise more funds, I believe that I have impacted RebelTHON and Dance Marathon in a significant way. Hailey and members of the RebelTHON executive board dancing on stage. My abilities in the areas of conflict management and relationship development have been shaped and polished by Dance Marathon. The inevitable arguments and challenges that accompany a group of extremely passionate student leaders, working to balance schoolwork and Dance Marathon, make for interesting cases in conflict management. One such case occurred when our merchandise t-shirts for a registration push day did not get approved, even though we had already had them printed. I had to refocus the Board towards our mission of serving the hospital and the kids, which was especially challenging in the face of losing money over merchandise. The incident actually allowed our leadership the opportunity to discuss hospital protocol and expectations with our advisors, and this was highly beneficial for the rest of the year. Additionally, our relationship with our university advisors and partners was developed this year in ways that we did not expect. Because the Office of Leadership and Advocacy had only been our on-campus resource for a matter of months when I came into the Presidency, there was much to do in regards to building our relationship. Over the course of the year, I was able to work to build trust between our Executive Board and University Advisors. 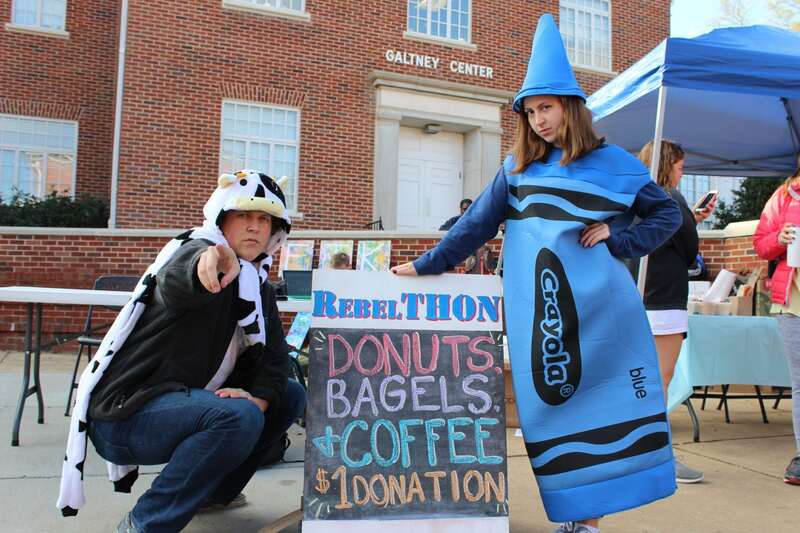 Through the various challenges that came our way and my mediation between students and advisors, we have built a relationship that will be beneficial for RebelTHON 2019 and beyond. Student leaders feel comfortable approaching our advisors with questions or concerns, and the advisors know that they can trust RebelTHON leadership to act in the best interests of the university. My abilities in conflict resolution and relationship building, through the various challenges and obstacles that were thrown at RebelTHON 2018, were strengthened immensely. Hailey at an on campus fundraising event. I spent every day until I was 2 years old at my grandmother’s house. We watched PBS, Golden Girls, and soap operas while my parents were at work all day, every day. Mimi was a trained opera singer, so we went to symphonies, operas, and art shows together constantly. Even when my parents decided that I needed to socialize with kids my own age and sent me to daycare, we remained best friends. For the next few years, Mimi and I still did everything together. We visited with her at least every weekend, and she was always there for every school event, dance recital, etc. However, when I was 8 years old, Mimi was diagnosed with Alzheimer’s disease. Essentially, her brain is slowly destroying the connections she has held to remember everything from her childhood to her career to how to use a spoon until, eventually, she forgets everything. Since I was around 15, Mimi has been unable to recognize me when I visit her. She was my best friend, and she forgot that I existed. She forgot the amazing adventures that she and my grandfather took; she forgot how to play the piano; she has even forgotten how to feed herself. This breaks my heart every day, especially since I know that there is nothing that I can do to help her. 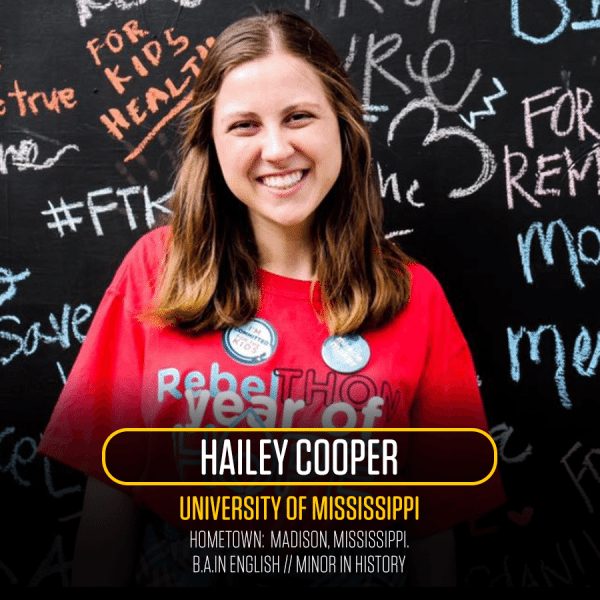 I felt helpless for years, until I found RebelTHON. There are kids in children’s hospitals around the country who will never even have the experiences that my grandmother has forgotten. There are children who will never see their high school graduation, and there are still more that will never travel the world. Because of Dance Marathon, I’ve finally felt like there was a way for me to help these children. Because of Dance Marathon, I have finally felt that I could actually make a difference. Because of Dance Marathon, I have changed my entire life plan to include a career in nonprofit management, and I could not imagine my life without it. I hope that I have been able to help patients at local CMN Hospitals create more memories through my participation in this organization. Hailey at Batson Children’s Hospital in Jackson, Miss. Dance Marathon has exposed me to some of the most passionate, inspiring students in the nation, and I believe that everyone who comes into contact with this movement cannot help but be changed forever. Our generation is often labeled as self-absorbed or incapable of true empathy, but I would challenge those who believe this stereotype to watch Dance Marathon students at their peak. The student leaders I have worked with over my college career undermine this image with selfless service and the utilization of technology to benefit others. My own growth, in addition to the growth I have witnessed in my peers, has convinced me that this movement changes more lives than those for whom we fundraise, and I would encourage anyone who wants to make a difference to become involved in it. After becoming intimately aware of my local CMN Hospital’s needs, I will always encourage donations to CMN Hospitals. The additional funding provided by donations to CMH Hospitals is crucial to the hospital’s ability to serve local children. Batson Children’s Hospital in Jackson, Miss., for example, is not allowed to buy child-friendly band-aids with the state funds it receives, so it relies on fundraisers like RebelTHON for additional funding. 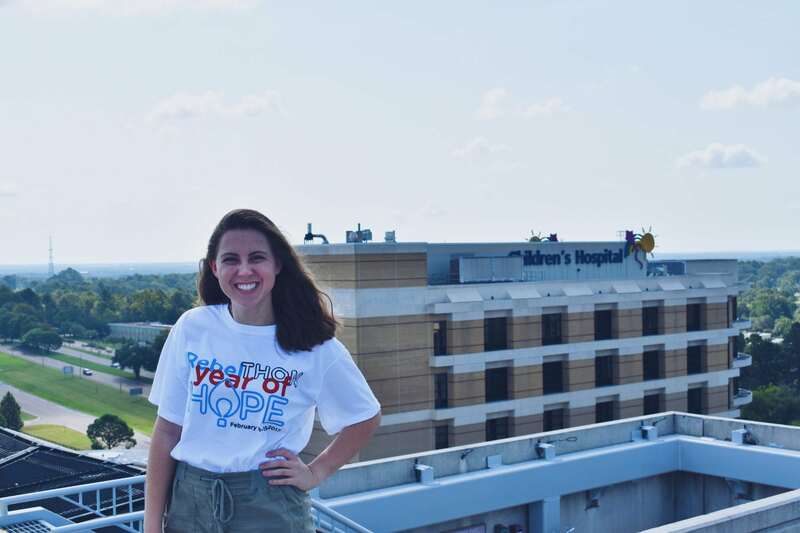 After developing personal relationships with families directly affected by donations to CMN Hospitals, I see first-hand the impact that even a dollar has on a tired, terrified family. The funds I was able to help raise in 2017 helped to provide an entire hospital floor of sleeper-sofas. I didn’t think much of this contribution until I came across a blog post of a mother who had used one of the newly installed sofas. She explained that, before the installation, she had not slept in almost a week due to the lack of options available at the hospital. To think that I was able to help provide a night of sleep for a tired mother changed my entire perspective, and it renewed my efforts to fundraise for the 2018 year. This was only one example of CMN Hospitals ability to change lives, and there is so much to be done. To contribute to such a deserving cause and be a part of something bigger than ourselves is amazing, and I would encourage anyone who is able to contribute to their local children’s hospital. 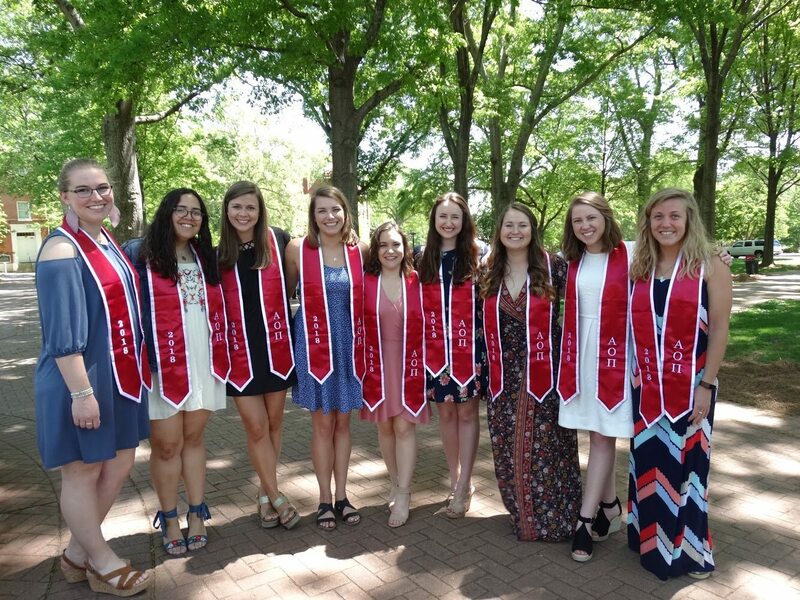 Hailey with graduating members of Alpha Omicron Pi at the University of Mississippi.